How Should Pagans Celebrate Thanksgiving? A reader writes in with an interesting dilemma. He says, "My family wants to have a big Thanksgiving celebration, but I don't want to participate. I object to this holiday as a protest of the treatment of Native Americans by my white ancestors. Any ideas on how I can survive Turkey Day and still hold true to my Pagan ideals?" You know, there are a lot of people who feel this way about Thanksgiving Day. To many, rather than the Brady-Bunchified version of happy pilgrims sitting around with their Native friends eating corn cobs, it represents oppression, greed, and cultural annihilation. For people of Native American ancestry, it's often considered a day of mourning. On the other hand, since Thanksgiving isn't a religious observation - it's not a Christian holiday, for example - many Pagans don't see it as objectionable at all. In fact, the observation of Columbus Day is a lot more troubling to many people than the Thanksgiving celebration. You have a couple of choices. The first, obviously, is not to attend the family dinner at all, but stay home instead, perhaps holding a silent ritual of your own in honor of those who suffered under the guise of settlement. However -- and this is a big however -- for many families, the holidays are the only times they get a chance to be together. It's entirely possible that you're going to hurt some feelings if you choose not to go, particularly if you've always gone in the past. No one wants Granny to cry because you decided this was the year you weren't coming to dinner with her -- after all, it's not her fault that you find Thanksgiving objectionable. That means that you'll need to find some sort of compromise. Is there a way you can spend the day with your family, but still remain faithful to your own sense of ethics? Could you, perhaps, attend the gathering, but maybe instead of eating a plate full of turkey and mashed potatoes, sit with an empty plate in silent protest? Another option would be to focus not on the Pilgrims/Indians aspect of the holiday but instead on the abundance and blessings of the earth. Although typically Pagans see the Mabon season as a time of thanksgiving, there's certainly no reason you can't be thankful for having a table full of food and a family who loves you -- even if they don't understand what the heck you're talking about. Many Native American cultures had celebrations that honored the end of the harvest, so maybe you could find a way to incorporate that into your celebration, and educate your family a little at the same time. 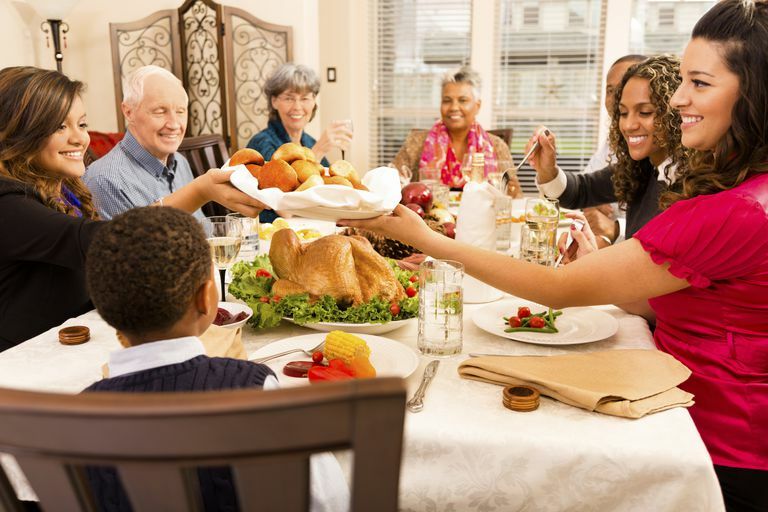 Finally, if your family says any kind of blessing prior to eating, ask if you can offer the blessing this year. Say something from your heart, expressing your gratitude for what you have, and speaking out in honor of those who were oppressed and destroyed in the name of manifest destiny. If you put some thought into it, you can find a way to hold true to your own beliefs while educating your family at the same time. For anyone who's interested in reading an excellent book on what really happened at Thanksgiving, I recommend picking up a copy of 1621: A New Look at Thanksgiving by Catherine O'Neill Grace. It's a well-researched and beautifully photographed account of the Wampanoag side of the events leading up to the first Thanksgiving at Plimoth. When you have differences of political opinion, it can be hard to sit down and share a plate of mashed potatoes with someone that—despite being related to you by blood or marriage—refuses to engage in civil discourse at the dinner table. While it's easy to say we'd all like to have a "No Politics On Thanksgiving, Please Let's Just Watch Football" rule, the fact is that not everyone can, and this year many people are really dreading sitting down to eat turkey with their families. So here's a suggestion. If you really don't want to celebrate Thanksgiving, for whatever reasons, whether it's because you're troubled by the treatment of Native Americans by Europeans, or whether you just can't face the idea of sitting next to your racist uncle this year, then you do have options. One of those options is to just not go. Self-care is crucial, and if you're not emotionally equipped to deal with a family holiday dinner, opt out. If you feel uncomfortable saying why you don't want to go because you're worried about hurting people's feelings, here's your out: volunteer somewhere. Go help at a soup kitchen, sign up to distribute meals on wheels, build a Habitat for Humanity house, but do something for those less fortunate. This way, you can say honestly and truthfully to your family, "I'd love to spend the day with you, but I've decided that this is a good year for me to volunteer to help out those who are not as lucky as we are." And then end the conversation. Is Earth Day a Pagan Holiday? Are There Any Pagan Yule Carols?